"A fiery horse, with a headless rider, calls out to me. He lifts his right arm and in it is a burning pumpkin with a face carved into it. Its eyes pierce my very soul, and its smile torments me. This... would be perfect for a trap!" Zugzwang's Night-Mare Skin can be used on the Zugzwang's First Move. The trap's stats (power, power bonus, attraction bonus, etc.) are not changed. 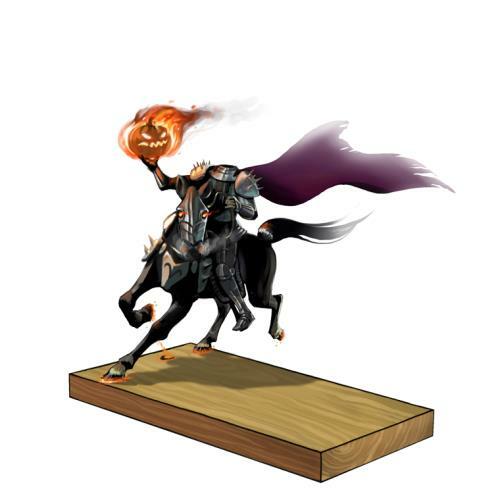 Zugzwang's Night-Mare Skin may be made available during the annual Halloween event and can be traded on the Marketplace or through Give To Friends. 7 October 2011: Zugzwang's Night-Mare Skin was painted live during an 'All about the art' Feedback Friday. Ideas and suggestions were provided by the audience at the time of painting. 19 October 2011: Zugzwang's Night-Mare Skin was released at the start of the Halloween at the Haunted Terrortories event. It was available for purchase for 20,000 gold and 8 Cobwebs at the Haunted Terrortories Trapsmith. This page was last edited on 9 December 2017, at 16:12.